The Rancho LPG tanks in San Pedro. The LA Unified school board yesterday became the first elected body to ask government officials to move one of the largest above-ground butane gas facilities in the country. 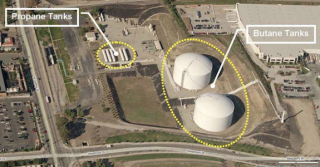 Located in San Pedro, the highly-flammable gas is housed in two storage tanks not far from three LAUSD school sites. School board member Richard Vladovic, who represents the area and has been pushing to move the gas tanks for the last five years, said they posed was a greater risk of disaster than the Porter Ranch methane leak. That leak resulted in the temporary relocation of two schools. “It’s a very dangerous situation,” said Vladovic, pointing to the Rancho Liquefied Petroleum Gas facility, which is close to Taper Avenue Elementary School, Johnston Community Day School and the Vic and Bonnie Christensen Science Center. The resolution, which won unanimous support by the seven-member board, warns of “a vapor fire, pool fire and boiling liquid evaporative vapor explosion” and calls for a relocation “to an area where it does not pose any harm to students and their families.” The board asked the superintendent to let city, federal and state officials know of their support. Weiss said the LAUSD resolution could nudge the Los Angeles City Council and harbor commission to take action after years of activists’ complaining about it. He said the owner of the facility is the same company, LPG Holdings, that owns the Santa Barbara pipeline that leaked last year. Weiss also raised concerns about whether the company has adequate insurance. LPG Holdings considers the site safe and points out that is has been on the hillside location nearly 40 years. A company website addresses concerns about the site and explains how the company is involved in many local civic activities. It says more safety construction was completed three years ago. Butane is a colorless gas that could cause drowsiness, asphyxia and frostbite if someone is in contact with it. The gas is transported by rail. Larramendi said the school board’s action is a “big step” to solving the concerns about the two 12.5 million gallon refrigerated tanks and five 60,000-gallon storage tanks.